Shazam! takes a lighter look at costumed superheroes, flinging off the usual DC Comics-inspired darkness for a joyful, energetic, and lighthearted romp. It’s a big, goofy film that offers two hours of escape from the world while delivering a little lesson on family, loyalty, and love. Zachary Levi perfectly captures what it would feel like to be a teen boy who suddenly discovers that not only does he have superpowers, he’s also aged into an adult. Tom Hanks set the bar high in Big as a boy who, through no fault of his own, ages up. But Levi’s right up there with Hanks’ take on an unexpected age jump. Levi rocks the superhero suit while Shazam learns to master his swagger as a savior impervious to knockout blows, bullets, high speed crash landings, and wicked one-liners delivered by his foster brother sidekick. This origin story does a terrific job of explaining how a teen goes from troubled foster kid to a savior in one mighty leap. As a child, Billy Batson was left behind at an amusement park by his single mom who apparently decided the responsibility was simply too much for her to handle. He was placed into the foster care system and spent his formative years attempting to track down the woman who deserted him, holding firm to the idea of a happy reunion. His quest to find his birth mom involved running away from a number of foster homes. At 14, Billy (Asher Angel) lands in a loving home with foster step brothers and sisters who immediately consider him family. His roomie turns out to be the reason he doesn’t bolt from this particular foster home. Freddy (Jack Dylan Grazer), a wisecracking, whip-smart, comic book-loving kid who uses crutches to get around makes a connection. They share a love of comics and when Billy is pulled into an alternate dimension, it’s Freddy who helps him figure out what’s going on. Billy encounters an ancient wizard (Djimon Hounsou) who’s been seeking someone pure of heart to pass on his powers to. The wizard’s spent eons hunting for the right person and has failed to find a champion. With time running out and the seven deadly sins now free to wreak havoc on humans, Billy’s pretty much forced into taking on a job he’s ill-prepared to handle. The wizard commands the teen to put his hands on his staff and say his name. Billy, after making a teenage boy joke about touching the staff, does as told, says Shazam! and – whammo! – he’s transformed into an adult superhero. The film’s uber bad guy, Dr. Thaddeus Sivana (Mark Strong), was one of the kids who didn’t pass the wizard’s test. He spent decades attempting to reach the wizard’s secret chambers before finally accomplishing his goal and unleashing the seven deadly sins. Now all he needs is to absorb Shazam’s powers and he can rule the world…or something like that. Freddy and Billy’s relationship is the very heart and soul of the film, and Zachary Levi and Jack Dylan Grazer have genuine chemistry on screen. Freddy and Billy put Shazam’s powers to the test with hilarious results, filming their efforts as they attempt to figure out what the costumed crusader without a decent nickname can and can not do. Levi and Grazer make for a terrific comedy duo, and their sibling relationship feels realistic and weirdly relatable given we’re talking about a superhero who shoots lightning bolts from his fingertips and can fly. Mark Strong dips his toes in the bad guy pool once again while The Walking Dead’s Cooper Andrews channels another lovable big guy as Billy’s foster dad. Strangely, Djimon Hounsou’s wizard reminded me a lot of the wizard in The LEGO Movie so it was tough to take his protector of the universe character seriously. 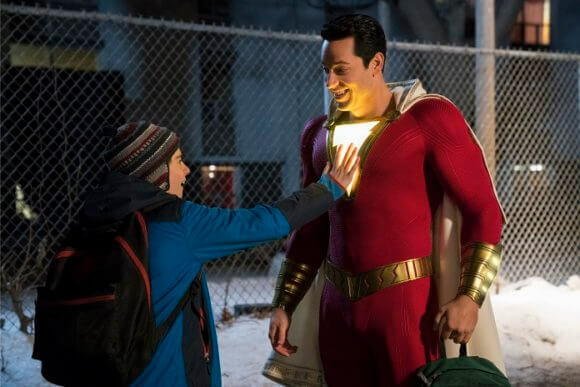 Of course, it’s difficult to take anything too seriously in Shazam!, which is how it should be. This is a campy, over-the-top, action comedy with heart, and not a comic book-inspired deep dive into the conflicted minds of flawed human beings. The special effects are first-rate, the entire supporting cast is strong, and Shazam! dishes up plenty of laughs. The only minor complaint is the running time, but for the most part the pacing’s tight. Shazam! isn’t the most popular superhero character, but this film sends his name recognition soaring.